HYDERABAD: Struggling to find a place in the city to play cricket or indulge in other sports activities? Feeling deprived of physical activity due to lack of facilities in your neighbourhood? It is a good news for sports lovers and fitness freaks, who are passionate about physical activity. ‘Groundwala.in’, a Hyderabad based startup, is offering a solution to people who are struggling to find a suitable place, time and team mates. One can just login to Groundwala.in and book a playground suiting their time and sport. This new age startup, which was started in November 2015 by young entrepreneur Ankur Singh has become a hit with sports lovers and also playground owners, by attracting over 5000 active users in Hyderabad. From facility booking to sports event registrations, Groundwala.in offers a range of services to players, sports facility owners, and sports event organisers. “Though it has been just seven months since we have launched operations, I have done lot of ground work before launching it to know about how sports events are conducted and how the venues are booked. Due to our home work and perfect planning, we could attract about 5,000 active users in Hyderabad. 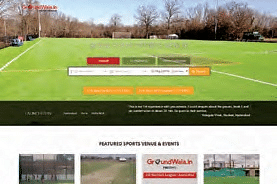 More than 125 sports venues have been registered with us,” said Ankur Singh, founder of Groundwala.in. Drawing inspiration from the success story in Hyderabad, they have extended the service to other cities like Pune and Delhi. Groundwala.in is a team of six members and founder Ankur is looking forward to expand the team. While they are facilitating cricket and badminton matches right now, Ankur is planning to promote football, which is gaining popularity in the country. With big plans to extend the services of Groundwala.in to other cities, the team aspires to become a household name among sports lovers, over the next year. But how come this young startup achieved success in just around six months of its launch? “The best investment in starting a successful startup is a good idea, which can give solution to a problem. I myself had found it difficult to find a suitable venue to play a sport many times earlier. As Groundwala.in addresses the problems faced by sports lovers in today’s busy times, we were able to strike a chord with the customers,” stated Ankur.